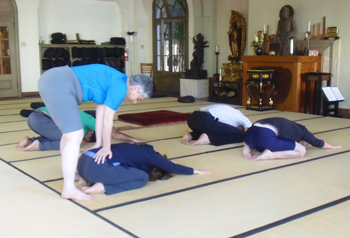 Over her forty-plus years at Zen Center, Shosan Victoria Austin has developed something of a reputation in the community as an expert in many different, specialized areas�from the esoteric details of dharma transmission ceremonies to the everyday issues of sitting posture. 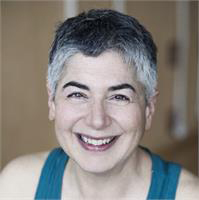 A longtime Iyengar yoga teacher as well as Zen teacher, Victoria regularly offers her valuable experience in these complementary paths to the Zen Center community. When, for example, students have trouble finding a comfortable position in meditation, frequently they find their way to Victoria. Once a month on a Friday afternoon before evening meditation, Victoria offers Meditation Posture Fridays: Yoga Practices for Sitters,� a drop-in class designed to address specific postural, physiological, or mental aspects of meditation practice, with hands-on adjustments�even in the zendo. The class alternates between short periods of yoga poses and seated periods to integrate the poses’ effects on seated posture. Victoria responded to a few questions recently about this customized, compassionate, donation-based offering. Was your initial interest in yoga related to any physical challenges of your own in your early sitting practice decades ago? Victoria commonly offers multiple versions of each pose with different levels of difficulty. I started practicing yoga and Zen meditation seriously on the same day in 1971, following a near-death experience which awakened me to some home truths about human life. The first 11 years, my style of practice was to throw myself in, with equal measures of fervor and ignorance. I so deeply wished to rejoin the oneness, light and peace I had experienced in that first experience, that I neglected how my structure and my capacity depended on each other. Without knowing what I was doing, I overworked my systems in an unwholesome way. 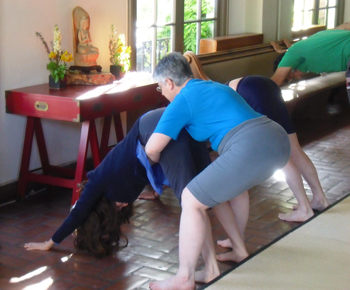 The experience of overwork and burnout in meditation spurred my decision to study and teach yoga as an expression of my ordination vow to benefit beings. Not only would I study the Buddha’s teachings of the Middle Way through the body, but I would develop the intention to thoroughly absorb the subject as the Buddha did, to teach meditation and absorption as natural consequences of yogic action, rather than as states of mind imposed by the desire to awaken. What�s the most common �ailment� that people come to you with�meaning, some physical discomfort or complaint about sitting meditation? Unease and dis-ease. Some aspect of their sitting practice does not feel settled, and that feeling is strong enough to permeate their entire practice. This can range from neck, back or knee problems to metabolic, hormonal or emotional issues. My practice is to meet the whole person, not just the condition. So, I don’t think in terms of “ailments” but rather in terms of causes and conditions. How is the person built, and how did that structure develop. What needs are met by the condition, and what are more wholesome and holistic ways the person could be physically and physiologically trained to meet those needs without maintaining the injury? Where is the person’s connection with the life force blocked or dim, and what needs to happen, to allow it to flow bright and clear? How long does it take to �get fixed�? There are some issues that “get fixed” in one session. For instance, a couple of weeks ago, someone came with a knee issue. I gave them a sitting pose that didn’t hurt their knees, and a way to work with their hips and ankles. The main change is in the person’s understanding of how to work with the knee. Some issues take a long time to “get fixed,” because to do so one has to deeply appreciate and develop skill in the causes and conditions that create the issue. For instance, for several years I have been working with a person who has deeply ingrained back pain. We worked with the back in layers, over a long period of time. First we learned how to create sensitivity there, because the person had developed body armor from being in pain for a long time. Then we learned how to create length passively and actively. 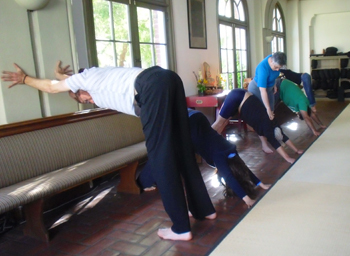 We created strength and coordination to maintain the length, while studying how to open the seated pose in all its dimensions. Finally, we brought to rest the part of the mind and emotions that had become fixed. What do you see from your perspective when you examine someone�s sitting posture? I study the whole person in the posture, examining their needs and their response to those needs, from the ground up. For instance, I often first look at the way they have sat down. What cushions did they choose, and are these props of a height and firmness adequate to support the person’s sitting pose? Or are the props creating extra effort for the person? For beginners, often I study how the person meets the ground, and how the balance or imbalance plays out in the rhythmic coordination of the entire seated meditation pose. It is like listening to music. I can be a music analyst, or I can listen to the rhythm of the person’s body and get a feeling for what is being expressed. I don’t always adjust people manually; sometimes I just look and learn. Sometimes I wait a few days, then suggest a change of props or posture. Manual adjustment is an intimate form of communication; listening to, and reflecting on, the rhythm of the whole pose comes first. The next Meditation Posture Friday is April 25 at 4 pm, followed by evening meditation in the zendo with posture adjustments. Follow the link for additional dates or for more about Victoria. She is also co-leading the next practice period at City Center, which begins May 12.